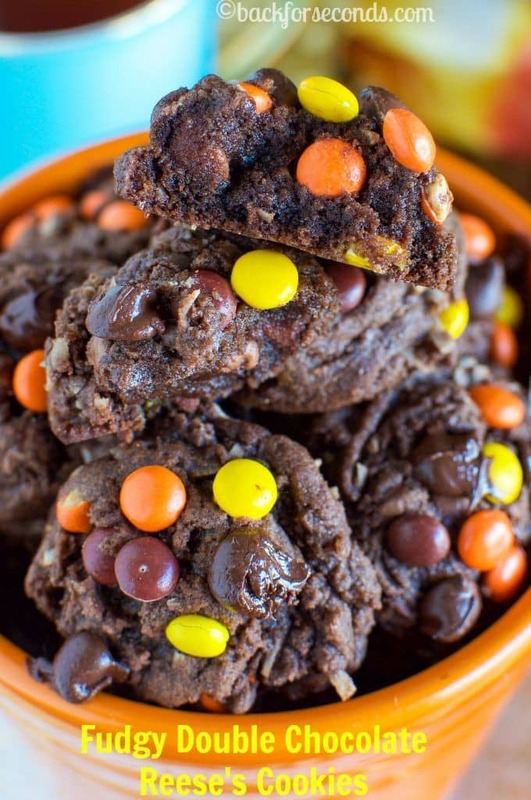 These are the perfect Thick, Soft, Chewy Chocolate Reese’s Cookies! Fudgy bakery style cookies loaded with chocolate, Reese’s Pieces, and coconut! 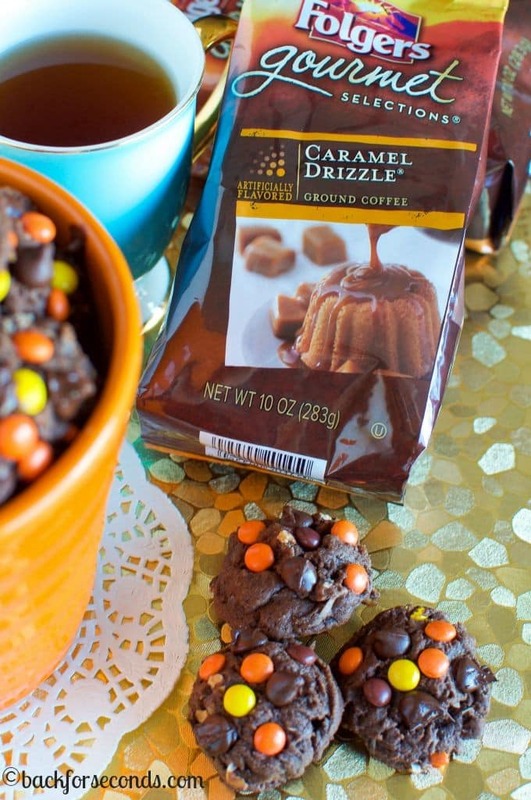 The perfect treat to enjoy with a cup of Folgers® coffee! 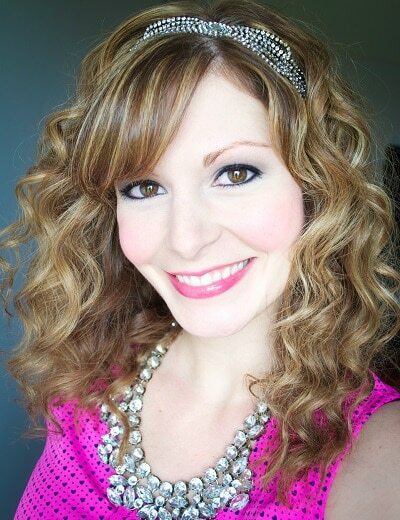 I am happy to be an abassador for Folgers® so I can share amazing coffee paired with delectable treats! Most people have a cup of coffee first thing in the morning. Not me. Afternoon nap time is when I get to sit down and get some work done, and I love to have a cup of coffee or two. This is the only time I can drink it without having to warm it up 15 times. If you have babies/little kids, you know what I’m talking about! And what goes better with coffee than cookies? Big fat, chewy chocolate cookies! Well friends, summer is officially over and fall has begun. I always hate to see summer end, but there are a few things I love about fall. Boots! I love LOVE boots and honestly it’s the thing I like most about cooler weather, ha! Also, fall makes me want to bake all the things. And drink all the coffee. I recently had the pleasure of trying Folgers® Caramel Drizzle® ground coffee. Holy moly. It’s wonderful!!! The soft, buttery caramel flavor is warm and comforting and so perfect for fall! The smell is so amazing – it’s hard to wait for it to finish brewing! I also have a bag of Vanilla Biscotti Coffee which I am breaking into tomorrow. I can’t wait! I just may have to bake a batch of actual biscotti to eat as I enjoy it. After all, what’s a coffee break without cookies? Today, however, I’m enjoying my Caramel Drizzle® coffee with a few of these Thick, Soft, Chewy Chocolate Reese’s Cookies. Oh my word. You guys, these cookies are the chubbiest, chewiest, softest cookies ever! I loaded them up with chocolate chips, Reese’s pieces, and coconut, and they are just perfection! I know a lot of people aren’t huge fans of coconut – it’s ok! Just leave it out and I promise they will be just as delicious! Also, the colors are on point for fall! 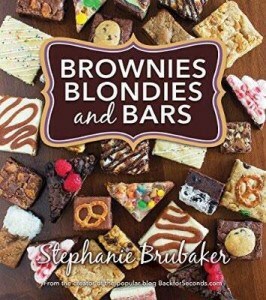 These would be a big hit at Halloween or Thanksgiving parties! 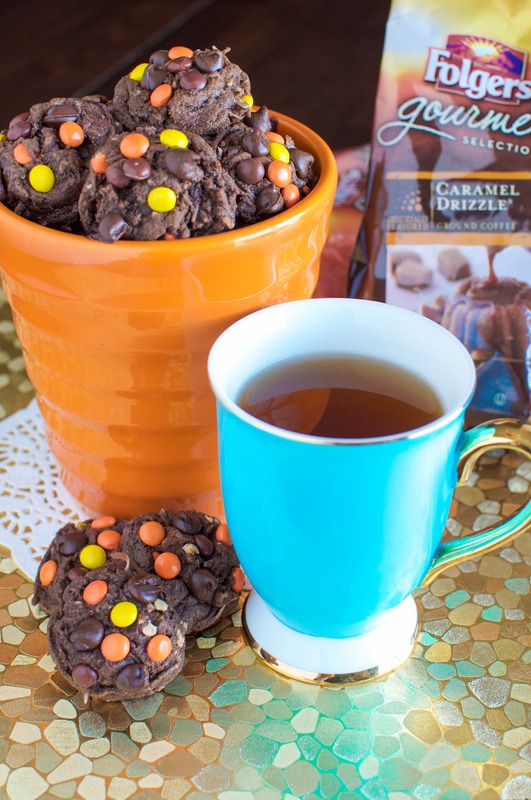 Now grab yourself a cup of Folgers® Caramel Drizzle® or Vanilla Biscotti Coffee and whip up a batch of these cookies, and I know you will have a smile on your face! I need these cookies right this minute. They look so inviting. My hubby is an absolute coffee fanatic so I bet he’s going to love these. The flavor of tat coffee sounds so good! I bet it goes great with the cookies. Pinning these because my husband would flip over them! 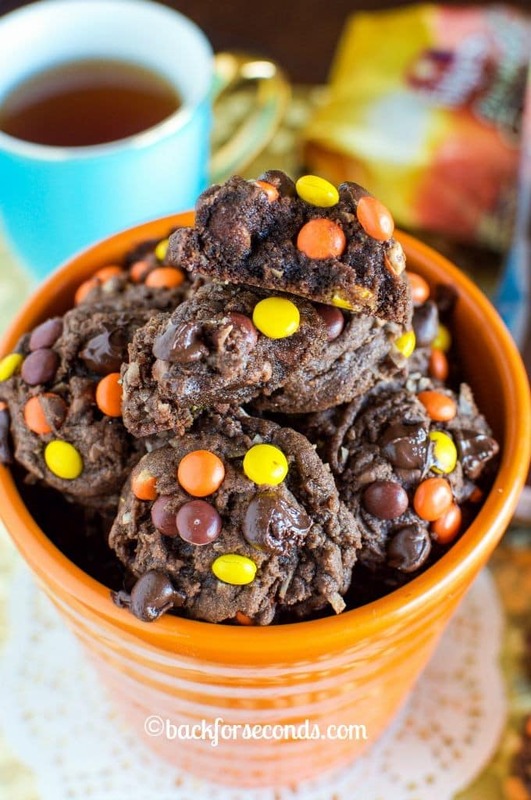 Chocolate cookies are the best and the reeses pieces make these irresistible!